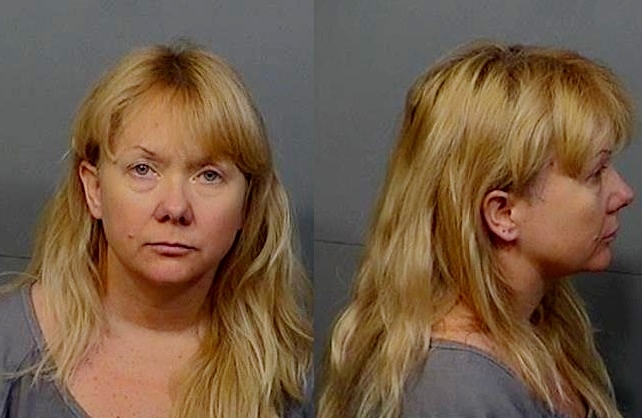 ROCKLEDGE, Florida - Dawn Marie Krell, a teacher at John F. Kennedy Middle School, was arrested on Thursday after allegedly battering a student who wanted to use the restroom. According to the police report, the dean of Kennedy Middle School was notified of a disruptive student in Krell's classroom around 3 p.m. on Friday, December 15, 2017. When the dean and principal approached the classroom, they saw the student standing outside the classroom door. The door was open and students were inside the classroom. When the dean asked what was going on, the student said that he asked to use the restroom but was denied several times by Ms. Krell. The student said it was an emergency but Krell told the student to go outside the classroom. The student said that Krell then followed him as he walked out of the classroom, placed both of her hands on each of the student's shoulders, and forcefully shoved the student up against a wall while saying that the student was disrupting her classroom. The student said that he told Krell that he was not being disruptive, but that he just had to use the restroom. The student then managed to push himself away from Krell. After listening to the student's version of events, the dean then asked the teacher to step out of her classroom. That's when Krell allegedly told the dean that the student was being disrupted and she asked the student to step outside of the classroom. The dean and the principal asked Krell if she put her hands on the child. That's when Krell demonstrated her actions on the principal by placing each of her hands on the principal's shoulders and pushed him backwards. But this wasn't the first alleged incident where Krell became physical with this particular student, the arrest report notes. About two weeks prior to Thanksgiving, Krell had allegedly grabbed the student's wrist and shook it so hard that the hand sanitizer in his hand would go into the trash can. After the first incident, the student's mother told Krell not to put her hands on her child again. The police also note that there were student witnesses to both incidents. When Krell was contacted by police, she declined to give a statement without a lawyer present. Krell was arrested and booked into the Brevard County Jail and released the following day on a $500.00 bond. "Our students’ safety and security is our schools’ first priority," said Brevard Public Schools spokesman Matt Reed. "BPS has offered support to the family and has cooperated fully with Rockledge Police."